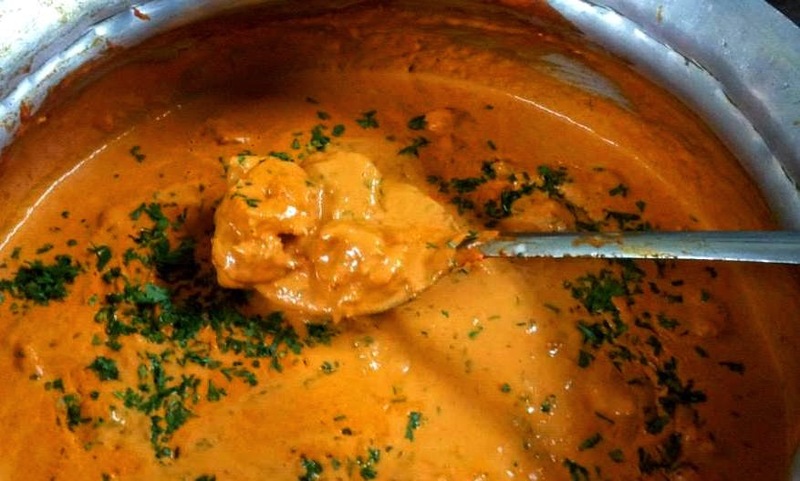 Today I am writing about a dish which is perhaps one of my most favourite Parsi dishes of all time (second only to Dhan, Dar ne Tareli Machchhi). This dish is known as Malai ma Kolmi and once again is a dish from the small coastal farming villages of South Gujarat. It is a dish that had almost vanished from the Parsi repetoire. This recipe was one from my maternal great great grandmother's (Soonamai's) kitchen in Tadgam, a small village about 7km north of Nargol and 8-9km south of Daman. Tadgam was the village of my maternal grandmother's maternal grandmother. My mother, Katy, spent many a happy summer here in her school days as my granma, Piroja, made her obligatory annual visit to see her maternal grandfather, Kanjibhai Patel. The Patel household was a farming household and numbered amongst its many denizens a few bullocks, a small herd of buffalos, a large numbers of chicken and random cows. Fresh milk and eggs were taken for granted as was the almost daily visit of the maachhan. The maachhan was the autochthonous fisher-folk lady belonging to the Maachhi community who carried her wares from farmstead to farmstead on a daily circuit. One rarely knew what she was bringing but one was assured that it would be incredibily fresh. Prawns, crab and lobster were invariably alive! The cows were milked by the household help and the male members of the family and skimming off fresh cream was a daily occurrence. The farm made its own butter, ghee and as a byproduct buttermilk. The food was simple but wholesome and Sooonamai was the Capo de tutti capi of the kitchen her weapons the ladle and spatula ably supported by various vicious looking knives. All food was cooked on wood and in earthenware or copper vessels. Prawns were a regular staple and on days when there was an excess of fresh cream the table would be graced by one of her classic dishes, Malai ma Kolmi or Prawns cooked in clotted cream. Its a relatively simple dish. You peel and devein the prawns (approx 1kg) and set them aside to marinate in salt and pepper. In a thick bottomed pan you add two large finely chopped onions and fry them in ghee till brown, remove onions reserve ghee. Make a fine paste of the onions with 1/4 kg broken Cashews, 6 Kashmiri Chillies and 6 Green Chillies. Heat reserved ghee in same pan and fry 1/2 teaspoon of Shahjeera for two minutes on very low heat, add the paste, increase heat to medium and cook for 5 minutes stirring continuously. Add prawns mix to coat well and cook on medium heat for not more than 5 minutes. Add half a cup of water and simmer for another 3-4 minutes or till prawns are cooked to desired consistency. Shut down the heat. Now add 200ml or 1/4 kg of clotted cream and fold it gently into the gravy till mixed well, close lid and let sit for 5 minutes, garnish with finely chopped corriander and serve with chapatis or rice. Tips: Do not add cream when the heat is on it may split. In lieu of clotted cream one may substitute it with Amul or any other brand in a tetrapack. Best eaten with rice chapatis (not bhakris) but making them is an art I for one haven't mastered. When my mother Katy first added this recipe to her bestseller Jamva Chaloji we were a bit sceptical about its reception. At the book release Manchi Cama couldnt stop talking about it whilst saying it was probably why Parsis had clogged arteries. But to our great surprise at Katy's Kitchen its a dish that has gone down very well with our clients and most of them come back for repeats. Its a simple dish and it gives me great pleasure to have been part of its revival. I think Soonamai will look down on me with favour. P.S. This is a part of my posts on Gastronomic Heritage and is an Heirloom Recipe. Kurush bookmarked this. This is stupendo- fantabulously awesome <3 what color and consistency of the gravy. Just perfect !! :) Thank you for sharing. What a fitting ode to Soonamai's remembrance! Indulgent yet simple in true classic style.